I’m sure you have heard of the “Dirty Dozen™ and Clean Fifteen™” list of fruits and vegetables that the Environmental Working Group (EWG) publishes every year? Well, the new list is out for 2014 and it’s purpose is to guide it’s readers on how to “shop smart” when buying your produce; they also say “If a conventionally grown food you want tests high for pesticides, go for the organic version instead“, so I find this yet another “organic is best” marketing tactic. Asides from pushing organic, the biggest problem with this group’s list, is that it isn’t based on sound scientific evidence as my friend The Farmer’s Daughter explains in her post and it is also explained further here and here and here. The fact of the matter is, we should all be eating more fruits and vegetables—conventional or organic—in our diets. Our produce is safe to eat and we should not fear marketing-schemes like the “Dirty Dozen” list. 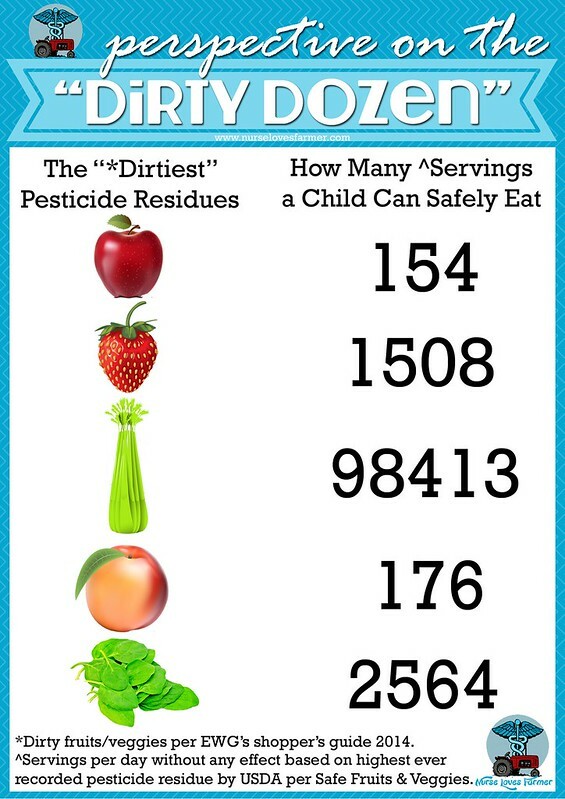 With the help of the pesticide residue calculator at Safe Fruits & Veggies, I’ve made an infographic to illustrate how even with the highest-ever recorded pesticide residues found on produce in 5 of the top 6 “Dirty Dozen” list (grapes were not available at Safe Fruits & Veggies), you would have to consume an extraordinary amount before you would feel any effect. To make this really hit home, I’ve based my numbers on servings per day for children. As you can see, a child would have to consume a LOT of these “dirty” fruits and vegetables per day in order to start seeing any effect. If you have questions about these calculations please read their FAQ. Here is a little fun fact for you that I find to be quite ironic and it makes me smile big, huge, biotechnology-loving smiles for the fact that such a big myth about GMO crops is that they “require more pesticides” which is not true. 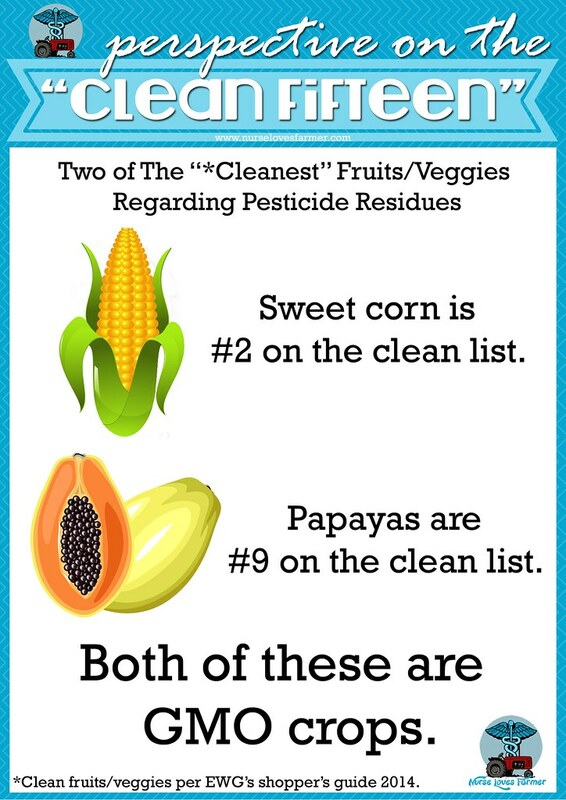 No, not all sweet corn or papaya is GMO, but there certainly is some. Regardless, we can rest assured that we are lucky enough to live in a country where our food is safe, abundant, and that we have a wide variety to choose from no matter how it is produced. If you’re worried about your produce having pesticide residues, fill your sink with cold water and a cup of vinegar and soak your produce to wash it. I’ve heard great things about this method and supposedly the produce will last longer too. The only people who should be complaining about food are the ones who don’t have any. Please feel free to share this post and share the infographics with your friends who are concerned about the “Dirty Dozen” list. I just ask that you please do NOT manipulate the graphic in any way and give credit back to me when you share. Thanks for reading! ETA: It was brought to my attention in the comments and on Twitter that using Safe Fruits & Veggies is a biased source, so for those of you who would like an unbiased source that comes to the same conclusion about the EWG please feel free to read Dietary Exposure to Pesticide Residues from Commodities Alleged to Contain the Highest Contamination Levels in the Journal of Toxicology. 1. Safe Fruits & Veggies — at the end of the article, this source is discussed as being biased. No science there. 2. An article from the Journal of Toxicology dated May of 2011. So what I observe is a) someone who isn't a scientist b) citing only one article c) which is four years old. The standard of critical thinking is the citation of a minimum of three unique sources and a conclusion which all three support. I'd like to see more research, particularly given the author's credentials. Hi Donna, If you follow the various links in this article it's easy to follow the science trail. I am very aware that I am not a toxicologist, if you are can you please publish an article so I can read it? I agree consumers shouldn't fear food conventional or organic. If Americans' ate more fruits and veggies instead of processed food it would solve many problems. I'm having a harder time agreeing with all your information on pesticides. While they are widely studied and you may have to eat an astronomical amount of food before you would see an IMMEDIATE effect causing symptoms. You didn't address the more subtler long term effects pesticides and some chemicals may cause or the controversy over Endocrine Disruption caused by pesticides. I'm a farmers daughter that started having problems in my early 30's regulating my thyroid requiring medication. I also started taking estrogen because my body wasn't producing enough estrogen on its own. Both times I had symptoms I couldn't ignore and believe me I tried to find an alternative fix before choosing medication. This is where my journey and investigation started. Not everybody gets all the information from EWG or Food Babe. The study of hormone disruption is a fairly new science, only a few decades old. Yes it is controversial, but I wish you would have at least brought up the topic so your readers could research another vantage point. There is world wide interest which includes scientific data on this topic. All people, not just farmers, can be effected by hormone disruption. We are exposed through food, water, air and a host of other sources I wont address here. It is a big picture problem and I look forward to more science in the future on this topic. Well, there's a LOT of vantage points I could take on the topic of pesticides, it's a pretty broad topic, yes? Perhaps you can start you blog and explore the topic too? Well done! I know both conventional (so called "mass") farmers and organic farmers and, in my experiences, I see the same level of concern for the environment and nutrition and safe food (and the same hard work to do the right thing by the land and by their animals), no matter what the size of operation or method of production. It's frustrating that society wants to lump all "big" farmers into the "bad" category. We need all kinds of farmers and all sorts of farm sizes to produce the food farmers raise each and every day. Thank you for shedding light on this so that we can get beyond fear tactics and understand the reality of what's going on. I'm sharing! Wow! I would like to see an epidemiology study on the effects of pesticides from daily consumption over a lifetime! No way it can happen with out enslaving an individual and controlling their every move. With that said, there are some scientific facts we do know. Many pesticides sold to farmers were pushed through testing by big business and lobbyists. We know that many of them in certain dosages over time have been shown to have negative effects on lab animals. I do know that local organic farmers are more concerned about the environment and good clean food and less about their pocketbooks (organically standards are higher and more difficult to achieve), unlike conventional mass farms ran by corporations or with gov subsidies. I feel like these types of articles hurt people more than help. Matthew, the epidemiological studies have been done. You don't need to do a double-blind Randomised Controlled Trial (enslaving the individual, as you put it), you only have to look at the health outcomes for people who eat more fruit and vegetables versus those who eat less. You do that with big longitudinal prospective and retrospective cohort studies (often with tens or hundreds of thousands of participants), and with case-control studies. The results of that research shows conclusively that people who eat more fruit and vegetables have markedly better health outcomes on a wide range of factors than those who eat less. If pesticide residues were a big problem, then those results would not happen – we would instead see *worse* outcomes for people who eat more produce. If there is any adverse effect of increased pesticide exposure through heavy consumption of produce the effect must be so tiny that it is vastly outweighed by the health benefits of eating produce, whether organic or non-organic. We also have extensive data about the levels of pesticide residues found in the human body. For people who eat a lot of produce the levels are not markedly different from those who don't, and are well below the levels at which there is any likelihood of harm – another clear indicator that eating produce, whether organic or non-organic, is not associated with better or worse health outcomes, and that fear of pesticide residues is basically unfounded. The exceptions tend to be people who work with pesticides – farmers, pesticide manufacturing workers, etc – especially those who are older and who have had large exposures to pesticides during the period when farm and production safety practices were less well-developed. Studies which directly compare levels of residues in consumers of organic versus non-organic are hard to do; most people have not been exclusively consuming either type of produce, self-reports of diet tend to be very unreliable, and controlling for other possible exposures is extremely hard. Some attempts have been made to do this kind of research, but the studies have tended to be small, with contradictory outcomes, and plagued by poor research design. It is further confounded by the fact that (as David points out above) organic farmers DO use pesticides, just different ones, and not necessarily less toxic or more biodegradable than the ones used by non-organic farmers. BTW: Thank you, Sarah – I've shared your post on Facebook. It's a breath of fresh air to see sensible posts like yours,instead of the fear-mongering from the purveyors of misinformation. Food Babe, MindBodyGreen, Natural News, Mercola, and the rest of the nutjobs – I'm looking at you! Notice that they all have a major financial incentive to lie about this stuff: it's how they make their money, suckering the gullible and the confused. Thanks for posting ammo against the fear mongers. Easy way to stop all of my friends from reposting this stupid stuff. Keep up the debunking about food myths! Much appreciated and needed in Hawaii! Papaya farmers will appreciate this one! As a man I could eat 571 apples at the HIGHEST EVER recorded pesticide level per day before feeling adverse effects. The apple is apparently the dirtiest of the dirty dozen. If you put that into perspective its very remarkable. Also there is nothing saying that was conventional or organic residues. !feeling effects vs having them, two completely different things. @Alisha: it's servings per day, not per year, OK? I tried to do that, thank you! 176 servings of peaches a day. It would be fun… until serving number 5! Thanks for the great article and clear graphics. "The only people who should be complaining about food are the ones who don’t have any." Love this line, soooooo true. Thank you so much and yes, that line could be a blog post in itself. Wish people would stop demonizing our food system. These are fabulous graphics. And I'm totally laughing at the thought of a child eating 154 apples in one day. I am so tried of food being marketed with fear and without regards to the actual science. My recent post Project 2014: Week 8 (Sister time). Heh–right–you know what would make a kid ill? 154 apples. But before that he'd asplode. Yet another fabulous post Sarah! Thanks for that 🙂 That is exactly why they publish it, to boost organic sales, why? I'm not sure. They seem to be funded by private backers so I'm not sure exactly who they are or what their actual agenda for this list is. Maybe there is no agenda? Just feeding people things that don't have so many chemicals in them?? or is that too utopian?? Unfortunately in our industry that is often not the case. The dirty dozen is misleading and it creates fear because the information is not inclusive. Often images and stories like this are put out by the organic industry as a marketing tool to encourage consumers to purchase organic produce over conventional, the problem is organic farming methods use pesticides as well, and the ‘Dirty Dozen’ (as Jay has pointed out) does not specify if between organic and conventional . What we are opposed to as farmers is the creation of fear when it comes to our food production, especially when it is unnecessary(which is most of the time). This is why it is so important to include all the information. Yes apples are at the top of the list but they are still not anywhere close to what would be considered harmful, unless of course you are one of those people who eat 154 servings a day on a regular basis. Safefruitsandveggies.com is sponsored by the PMA which is sponsored by Monsanto who sells pesticides. I'm not sure I understand your point, Heather? Would it be that Monsanto is making money buy sponsoring a once removed resource encouraging people to eat fruits and vegetables? I sincerely want to understand what point you're trying to make, especially in regards to Monsanto. Monsanto is most well known for the pesticide Roundup and anything that is NOT Roundup Ready/resistant will die. If you spray RoundUp on fruit and vegetables you will kill them…there won't be any residue because the tree/plant/bush will die, per my understanding and I'm happy to be corrected. The way I see it is that SF&V are not "slamming" or "bashing" organic produce whatsoever, they are countering the EWG's message of "if you can afford it it's best to buy organic" on their Dirty Dozen list with no science backing that statement. Why is the EWG not demonized for being organic-pushers but the SV&F is being demonized for trying to educate people on pesticide residues? This is what frustrates me so much as a conventional farmer—that our practices and methods are so misunderstood and fear is perpetuated because of it. It's pretty simple. If Monsanto makes people believe pesticides are safe then they sell more of them. And I don't know why you chose that resource as the best one to make your point anyway. You knew people would question it, yet still you chose it over an unbiased source. Which makes me believe that the bit about people not being afraid of produce was just an excuse to bait people in to argue over Monsanto. And because of that, I'm done. Have an awesome week. See you round twitter. I cannot even come up with a civil response. Have a great week too. Heather, if you would like the data for the analysis that both the EWG and SV&F use check out the USDA Pesticide Data Program website (http://www.ams.usda.gov/AMSv1.0/pdp). Also, for an analysis please read this article about how the information the EWG presents is essentially useless (http://bit.ly/1i9wIrz). "It is concluded that (1) exposures to the most commonly detected pesticides on the twelve commodities pose negligible risks to consumers, (2) substitution of organic forms of the twelve commodities for conventional forms does not result in any appreciable reduction of consumer risks, and (3) the methodology used by the environmental advocacy group to rank commodities with respect to pesticide risks lacks scientific credibility." Yeah, there is something funky with the links and you did post the correct links. Thank you. Actually Heather, as far as I know Monsanto really only sells seeds and round-up which isn't a 'pesticide' at all. So the logic you are using really doesn't make much sense. You can check it out for yourself; http://www.monsanto.ca/products/Pages/default.asp… And the only person bringing up 'Monsanto' is you so I really didn't get that angle from what Sarah was saying at all. The point is don't fret about the difference between organic apples and conventional apples, just feed your kids more apples!! "Well, first of all, safefruitsandveggies.com is funded by The Alliance for Food and Farming, a non-profit organization comprised of both organic and conventional farmers, with additional funding from PMA. PMA has many annual partners and Monsanto is only one. I am kind of lost as to how they think Monsanto influences all of those people, companies, and/or organizations in such a way as to make them say something that isn't true. Also, Monsanto only sells RoundUp, so what motivation do they have to make people accept other pesticides? http://www.pma.com/…/visibility…/annual-partn… "
Thank you for sharing this. I'm on the side that fear is the worse thing for your health. It seems to be so popular to make people terrified of their food. Followed you everywhere, so happy to find someone else who doesn't want people to be fearful but to be educated! Thanks for sharing on Twitter and I completely agree with your "fear is the worst thing for your health" statement—so true!!! Over my child's lifetime just one of my 4 kids is going to eat way more 154 servings of apples. Not to mention apple juice is used as filler in a ton of juice blends (unless I juice myself.) 154 servings is an apple every second day. My kids definitely eat that much. So in less than one year they pass that "safety" standard…. or am I not understanding the calculation. You also speak of choices. If we do not support local/organic farmers we will cease to have that choice. It's not over a lifetime, a serving is per DAY. I highly doubt any child eats 154 servings of apples per day; if they do I think they'd have bigger problems like all the fiber they would be consuming….anyone have the number for a good plumber? 😉 If you want more info on how this number is calculated, just visit the FAQ link that I provided in my post. Of course I support choices. I fully encourage anyone to buy whatever they want. But local is not synonymous with organic. I don't know percentage-wise, but just because you go to a local farmers market it doesn't necessarily mean it's organic. I grow my own veggies and am planting some berry bushes this spring, but I also use synthetic fertilizer so therefore I am not technically organic. I wouldn't believe anything is organic unless the certification seal accompanies it or you grow it yourself. No need to apologize at all, that's what the comments section is for! The thing about pesticides, if you're truly interested in learning more, is that often the synthetic pesticides conventional farmers use are better for the ecosystem than the organic ones that organic farmers use when they need to. I think, as I say like a broken record, that yes it's great we have the choices we do…but it's also important to not spread fear about our choices like the EWG does with this list they publish every year. The goal and message should be to eat more healthy, this list is just a fear-mongering marketing tool. I was thinking the same thing Alisha. My 5 yr. old eats two apples a day and juice for breakfast. I was thinking maybe we were doing ok buying conventional apples but I am going to rethink that now. However, this information was helpful in that I certainly won't be concerned about celery anymore or even strawberries as we only enjoy them a short time of the year. It is always about choices and everyone has the choice to choose conventional or organic. It isn't really helpful in making informed choices either way when a marketing slant is put on the information. When it comes right down to it, it won't help your children to go into debt to buy organic everything but they still need to eat fruits and veggies so just do the best you can with what you have. The people who advocate against pesticides are doing so with a marketing slant of pushing organics. Right. So is it not safe to say that the other side, which slams organics, are advocating with a marketing slant to sell pesticides? I'm pretty sure which side I'll err on. Sorry but this logic falls pretty short for me. I see your point, Heather, but the Safe Fruits and Veggies website clearly states that it doesn't matter if you buy organic or conventional it's just important to eat more produce; I wouldn't say they are "slamming" organics. They're just demonstrating that the pesticide residues that are found, are at a very very safe level to consume and that consumer should not be feared into buying organic produce for this very reason. I fully admit that I have a "stick up my bum" about organic products,solely for the way they are too oftenmarketed using fear. I have heard from organic farmers that conventional products use fear to market as well, but I am confident to say that it isn't nearly on the same level. Thank you for the comment, as I always say we are just lucky to have the choices that we do. ETA: Safe Fruits & Veggies uses science to promote their message and the EWG does not, that's where my logic is. Heather, often times the people pushing organics think that organic farmers do not use pesticides. That is false. Also, this isn't about slamming organics or trying to sell pesticides (cause if it was about selling pesticides, organic pesticides would be included in that process), it's about providing accurate and good information on all agricultural practices. Shared and thanks, well done!